For those observing Ramzan fasting, it will help to start a day with a heavy and nutritious meal so that the body feels satiated for the remaining day, suggest experts. 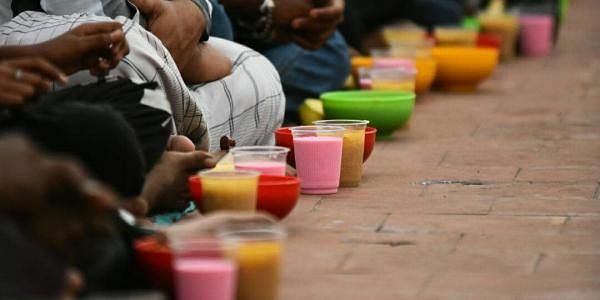 NEW DELHI: For those observing fasts during the holy month of Ramzan, it will help to start a day with a heavy and nutritious meal so that the body feels satiated for the remaining day, suggest experts. Never skip the early morning meal that is Suhoor/Sehri as that is the fundamental meal your body depends for the rest of the day. Start your day with some nuts soaked overnight, followed by a juice or milk along with fruits. To ensure that you feel full during the rest of the day, opt for high-fibre foods such as multigrain breads with paneer/ chicken/ eggs along with vegetables. Oats or multigrain atta for stuffed parantha with paneer or with egg bhurji cooked on a non-stick pan will keep your body satiated for the day. In the evening, open your fast with a glass of lemon water with sugar and salt in it to provide your body with the much-needed hydration. Dates are both customary and important as they are a high source of energy and rich in vital nutrients. After a little gap, eat a proper meal that includes the likes of brown rice or high fibre roti with lots of vegetables salad, plus lean meat or fish or eggs. Diabetes: A diabetic person observing Ramzan fast has a high risk to suffer fluctuations in the body glucose level. Untimely meals and improper intake of medications can cause the blood sugar levels to drop significantly and cause hypoglycaemia that leads to weakness and fainting. Hypertension: People suffering from high blood pressure have to take medicines timely, as skipping can cause serious repercussions. Fasting during Ramzan due to its strict rules does not allow intake of medicine or water during the fasting hours. Such changes in blood pressure can do a lot of harm. Thyroid: For someone who is on a regular course of thyroid medication, improper or untimely intake of medication can cause hormonal imbalance in the body. Do not skip your medicines. Dehydration: Fasting for long hours without any food or water during the hot weather can cause a few health complications like dehydration, which can further cause weakness, lethargy, and headache. Stomach problems: Long hours of empty stomach can cause discomfort and gastric problems like bloating, ache and gas to name a few. Do not skip your share of 'sehri' to avoid any stomach woes. Cholesterol: The food consumed during fasting are usually loaded with fat and are deep fried. It can lead to an increase in the cholesterol levels of someone already suffering from cholesterol and heart problems. Weakness: Not everyone can afford to stay on an empty stomach for long hours. Long hours' deficit of food and water can also cause weakness in many.